Foods that combine fats and carbs appear to send the human brain haywire, creating rewards above and beyond what people get from foods that contain either ingredient alone, researchers reported Thursday. They think their experiment, using real-time brain scans, may help explain why so many of us are obese, and why we overeat even when we are not hungry. 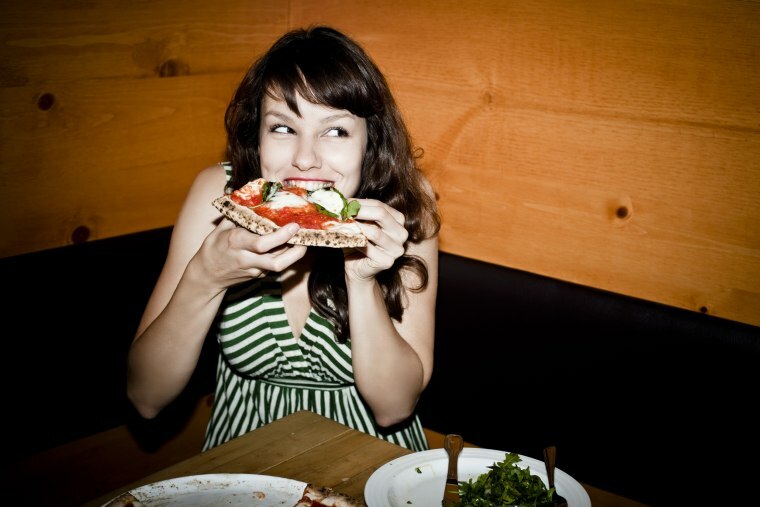 Modern processed foods like pizza, burgers and pasta with creamy sauces trigger our brains in ways that naturally foraged foods never could, they report. And it's in a way that people are not even conscious of, said Dana Small of the Modern Diet and Physiology Research Center at Yale University. "Liking has nothing to do with this response," Small told NBC News. "Certain foods are harder to resist." Foods that combine fat and processed carbohydrates stimulate the brain even when people claimed they did not particularly like that food more than others, the experiment showed. “We demonstrate for the first time that foods containing both fat and carbohydrate are more rewarding, calorie for calorie, than those containing only fat or only carbohydrate,” Small's team wrote in the journal Cell Metabolism. And it was greater than just the effects of adding the carb response to the fat response. Foods that combined carbohydrates and fats generated a response much greater than the sum of the parts, Small said. The team also showed which parts of the brain are responsible for this greedy response. They recruited 206 volunteers and gave them a small amount of money — under $10 — to “bid” on snack items. They also asked their volunteers to pick their favorite foods from this list of 39 foods. Their volunteers agreed to sit in functional magnetic resonance imaging (fMRI) machines while looking over the “menu”. "Certain foods are harder to resist." Some of the foods were mostly fat, like cheese cubes. Others were mostly carbs — think white bread or sugary candy. And some combined fat and processed carbohydrates — chocolate chip cookies, for instance. The volunteers' brains were scanned as they decided how much to bid for reach snack. “Participants are willing to pay more for fat plus carbohydrate compared with equally familiar, liked, and caloric fat or carbohydrate foods,” they wrote. The brain regions that were the most active in making these assessments were “reward” areas including the dorsal striatum and mediodorsal thalamus. "It one of the first studies to show that our modern foods, processed foods, are different. They are affecting our physiology differently," Small said. They also asked their volunteers to estimate how many calories were in the foods offered. “Our participants were very accurate at estimating calories from fat and very poor at estimating calories from carbohydrate," Small said. Modern life can confuse the human brain, which evolved when people had to forage for food and rarely ate different foods together at the same meal, the researchers noted. “The modern food environment proffers up nutrients in doses and combinations that do not exist in nature,” they wrote. There is no natural equivalent of a doughnut or a burger, for example. Combining fat and carbs may overstimulate the brain’s reward mechanism much in the same way as drugs of abuse do, the researchers said. "It's not a conscious response," Small said. "It's not pleasure, so what is it? It is an unconscious signal." That may explain why it's so hard to resist the foods that are bad for us, she said. "Foods in the modern environment trick those (brain) circuits," Small said.